Linzer Torte is basically a tart made with an almond crust and a fruit preserve filling. 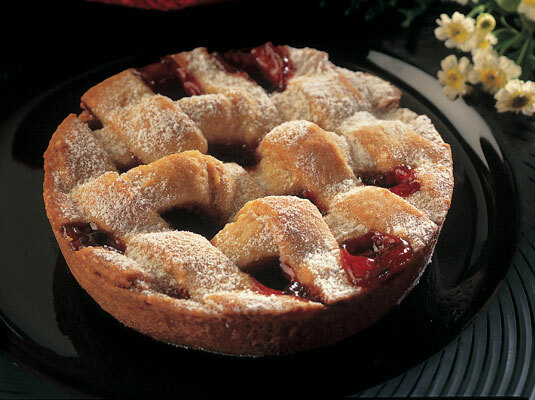 A linzer torte has a latticework crust — that is, strips of dough are laid across the top in a checkerboard fashion, leaving some of the fruit filling exposed. In a large bowl, combine the brown sugar and almond paste. While mixing with an electric mixer or wooden spoon, add 1 egg. Mix until the mixture becomes smooth and creamy. When you see the mixture forming on the side of the bowl, stop and scrape it down. Add the butter and shortening while mixing. Continue to mix until all lumps are dissolved. Add the flour, salt, cinnamon, baking powder, and the remaining egg. Scrape down the bowl once. Using a wooden spoon, spread about 3/4 of the dough mixture over the bottom of a tart pan. The dough should slope upward toward the sides of the tart mold and be about 1/2-inch thick. In a bowl, combine the raspberry preserves and the apricot preserves. Use a wooden spoon to spread the preserves over the tart dough. Apply more preserves to the outside edges of the tart bottom than to the center. Spoon the remaining dough into a pastry bag with a #5 (or smaller) round or star-shaped tip. Squeeze out parallel strips of dough over the top of the tart. Repeat Step 17 at 45-degree angles to form diamond shapes on the top of the tart. Leave some of the preserves exposed. Squeeze some dough around the rim of the tart. Crimp the dough with your fingers to form a decorative pattern. The particular pattern isn’t vital, but just be consistent all the way around the rim of the tart. Bake for about 40 minutes or until the crust is golden brown.